A new business centre in the CBD of Adelaide will support international defence companies to establish in South Australia. Launched today ahead of Euronaval in Paris, the Defence Landing Pad will provide a home for global companies to develop their Australian business strategy and plan local operations. The centre will be in the historic Margaret Graham building in Lot Fourteen, a former hospital site in the capital of Adelaide that is being transformed into a business precinct. South Australia’s Premier Steven Marshall said the initiative would enable international businesses to build relationships with South Australian businesses and create opportunities for supply chain collaboration. “The Defence Landing Pad combines our defence industry credentials with our culture of innovation to produce an offering that will be hard for companies thinking about investing in Australia to resist,” he said. “It is a win-win for both international and South Australian companies and demonstrates our innovative approach to doing business. Lot Fourteen offers more than 23,000m2 of space for innovative projects, with the Defence Landing Pad being situated in the Margaret Graham Building (No.2). Administered by Defence SA, the lead government agency for all defence matters, the Defence Landing Pad will provide immediate access to affordable, short-term office facilities co-located with other like-minded companies and industry associations. Defence SA chief executive Richard Price said Landing Pad would provide companies assistance with local regulations, migration, business establishment and real estate, as well as information on workforce availability and skilling opportunities. “The Defence Landing Pad has already received a high level of interest, as it will make it easy for international companies to start doing business in South Australia,” Price said. South Australia is benefiting from Australia’s massive defence spending on naval shipbuilding and land forces equipment and is home to many international defence primes. 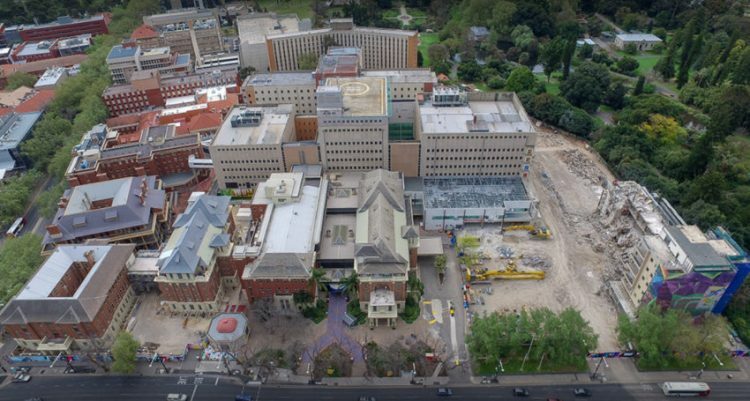 The Lot Fourteen redevelopment sits on the remnants of the old Royal Adelaide Hospital on Adelaide’s North Terrace and has more than 23,000m2 of space on offer. The site is envisioned by the state government to become a “globally-recognised creation and innovation neighbourhood”. 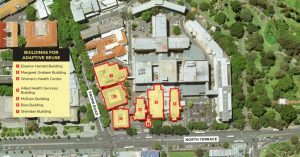 Its heritage-listed buildings have been marked for significant adaptive re-use on site and have been complemented by the construction of new commercial buildings to accommodate a variety of tenants. The Australian Institute for Machine Learning is an anchor tenant of the precinct (Building 3, above), and this month announced that Lockheed Martin Australia had signed on to partner with the University of Adelaide department. Defence and space company Myriota is also a tenant. The seven-hectare block will also house an innovation hub for startups that will have 650 workspaces as well as conference rooms, event facilities and meeting spaces. It will also house the Office of South Australia’s Chief Entrepreneur, Jim Whalley, the co-founder of Nova Systems.